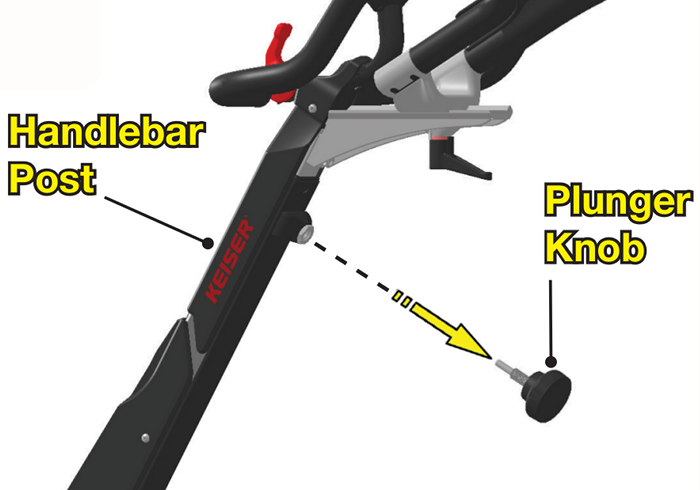 Lower the Handlebar Post to the lowest position, then remove the Plunger Knob by unscrewing in counterclockwise rotation. Warning: Wear eye protection. 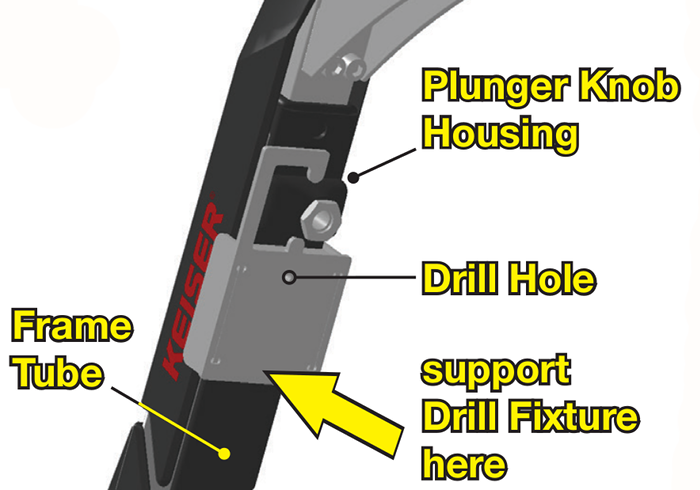 Place the Drill Fixture over the Plunger Knob Housing and Frame Tube as shown. Support Drill Fixture to the Frame Tube with your hand furthest from the Drill Hole. 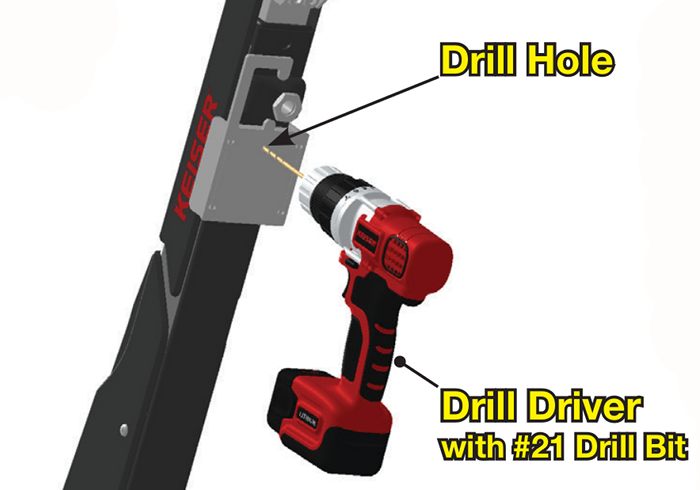 Drill into Drill Hole with the #21 Drill Bit provided using a Drill Driver. Drill through 1 wall of the Frame Tube (0.120”/3 mm thick). Once complete, switch Drill Driver to reverse to back out. Remove the Drill Fixture. 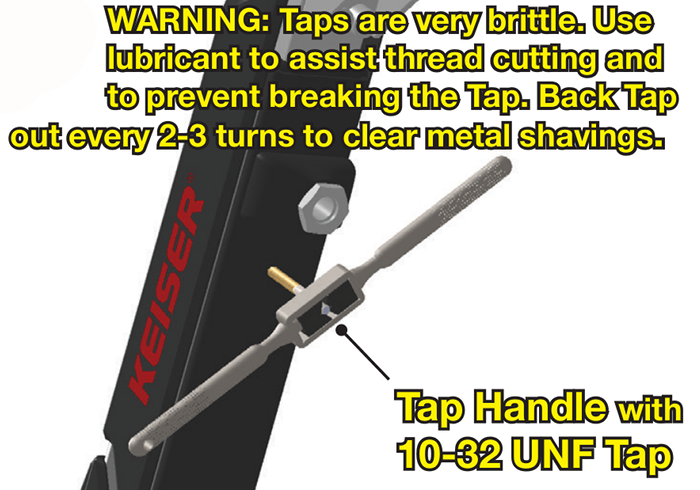 Prepare the 10-32 UNF Tap provided into a Tap Handle and apply lubricant to the threads of the Tap. Slowly work Tap into the hole of the Frame Tube in small clockwise rotations. Every 2-3 turns, back Tap out counterclockwise to clear metal shavings. Check to ensure the Tap is driving in straight throughout the tapping process. Once the depth of 0.120” (3 mm) is passed, back out the Tap by rotating it counterclockwise. Clean newly tapped hole of any excess lubricant and clear of any metal shavings. 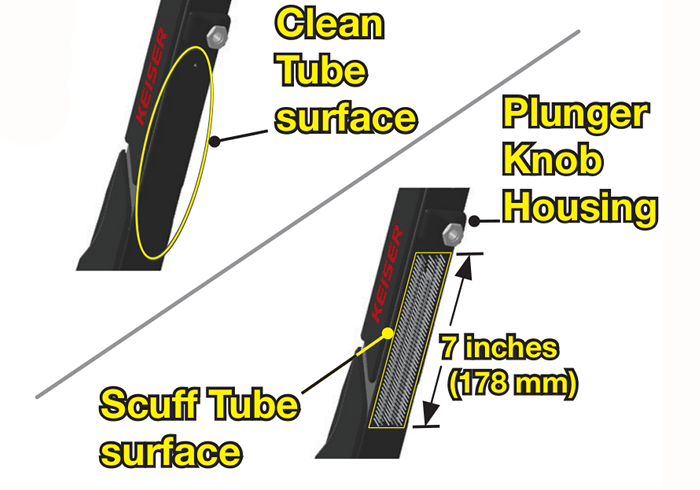 Using a scouring pad (such as general purpose, fine-grade Scotch-Brite, or equivalent), lightly scuff painted surface below the Plunger Knob Housing for the length of 7 inches (178 mm). Clean scuffed surface with 50/50 isopropyl alcohol/water using a shop rag. Allow the surface to dry completely before moving to next step. Remove backing paper from the adhesive on the Dumbbell Holder. 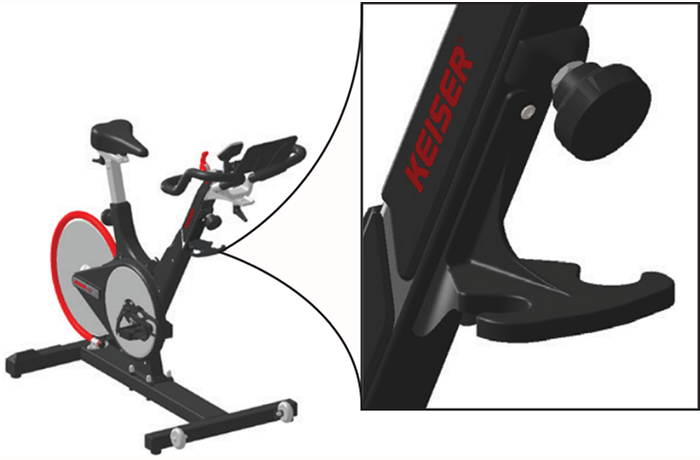 Align hole of the Dumbbell Holder with the tapped hole on the Frame Tube. Be sure it is properly aligned, as you will get one chance to apply the adhesive. 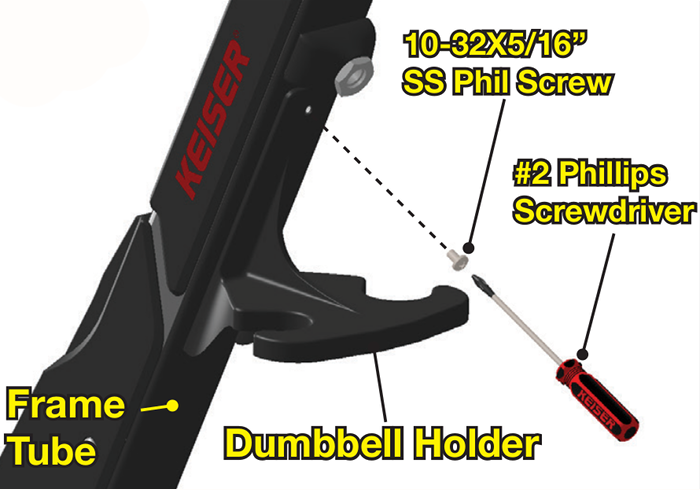 Firmly press Dumbbell Holder onto Frame Tube for proper surface contact and bond. Fasten the 10-32x5/16” SS Phil Screw into the threaded hole in clockwise rotation using a #2 Phillips Screwdriver.